Watching from a distant table, Lahni Irete finds herself driven back to the violence of her childhood and adolescence. The next day she shares her account of the happening with psychiatrist, Reynard Williams. Williams embraces the tale as a man seeking help to confront the core of pain that has distanced him from his wife and left him sexually and spiritually impotent. Along the way Williams consults with Sahel Denning, an injured psychologist no longer practicing psychotherapy. Engineer, Michael Banks, finds the restaurant incident a map guiding him on his path to reclaiming the events of the morning before he fell from the Richmond Bridge. Rumor and innuendo cloud Ariane Gadsen’s acquaintance with the story, propelling her down the path of reconciliation with what she is hiding. The restaurant scene stirred regret and despair within Trey Williamson, a widower, on his !rst date since the death of his wife three years earlier. The intimate backdrop of the restaurant containment wherein newly discharged Captain Darryl Sharpton reveals his most dark and intimate truth. 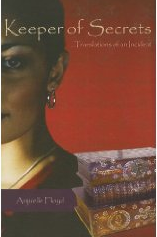 I was intrigued when I was offered the opportunity to read Keeper of Secrets – Translation of an Incident by Anjuelle Floyd. The book is a series of short stories with characters that intersect with an incident that occurs in a restaurant. The premise of the book interested me, so I delved in to find out what this book held. I found something unique at the front of the book – a list of characters for each of the short stories. I have to be honest – at first I was puzzled (as I have only seen this type of character list in plays) but, as I began to read the first story, I found myself flipping back to the description of each of the characters. I think that Floyd realized that the complexity of the stories might need some type of reference so she added the list of contents and characters at the front of the book. It was a brilliant idea as I did return to the list many times as I read Keeper of Secrets. Each of the stories contain a complex set of characters that come from a range of social, cultural and occupational backgrounds. The stories themselves are as diverse as the characters. The connecting event between the stories often draw the characters back to decisions that they made in the past and it impacts, directly or indirectly, the choices they have made in the past. While I did feel that the stories were interesting and complex, I felt myself continually feeling as if something was missing. I was constantly reflective, trying to pinpoint what I found the book to be missing. I finally realized that, while there is a lot of description, imagery and symbolism in the book, I didn’t feel connected to the characters. Part of the problem may be my own lack of cultural connectiveness to the characters in the book which led to my inability to relate to and understand some of the cultural nuances. I felt as though many of the stories could have been made into their own stand-alone novels which would have allowed for more development of the characters and a deeper understanding for the reader. If you enjoy stories that work together through connected events or those which are rich in imagery and symbolism, you will probably enjoy Keeper of Secrets. Though this book was not for me, I still think it has a lot to offer readers who enjoy something that is avant garde. The first three people read Keeper of Secrets and like it and post a review at Amazon.com will receive a free copy of her upcoming novel, “The House”.